Nashik Guardian Minister Girish Mahajan reiterated that Project Goda for Godavari will not only check its pollution but also beautify it. He was speaking at the Smart City Nashik Summit, organised by Nashik Municipal Corporation and Nashik Municipal Smart City Development Corporation Ltd in association with Elets Technomedia Private Limited-a technology and media research company. 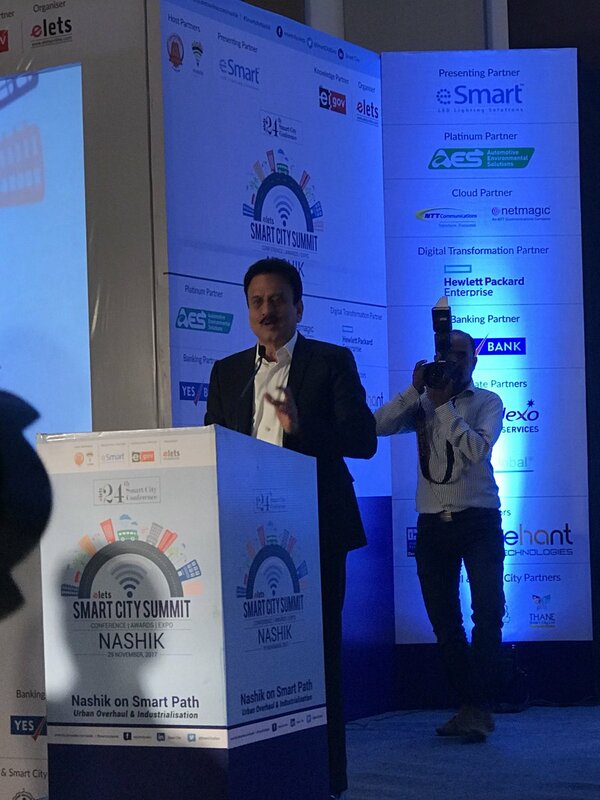 “It is a matter of pride that Nashik is one of the 90 cities selected under the Smart Cities Mission. The city has a huge potential owing to its proximity to Mumbai. After Mumbai and Pune, people talk about Nashik only,” said Mahajan after inaugurating the summit. The programme, chaired by Nashik’s Municipal Commissioner Abhishek Krishna, was also attended by Mayor Ranjana Bhansi Popat and Divisional Commissioner Mahesh Zagade. From across India, the summit was participated by Additional Commissioner of Municipal Corporation of Gurugram Narhari Singh Banger, Additional Commissioner of Pune Rajendra Jagtap, Collector and District Magistrate of Bhopal Dr Sudam Khade Industry leaders like General Manager of Products and Solutions at Netmagic Girish Sharma, Kaarthik Hariharan from UST Global and Coordinator of Policy-Advocacy at ITDP India Harshad Abhayankar presented their companies initiatives for Smart Cities Mission. There were detailed discussions on issues like IT & e-Governance, Command and Control Area Development, Smart and Energy Efficient Lighting, Riverfront Development, Traffic Management Smart Parking Safety and Security CCTV Surveillance, Greenfield Town Planning, Integrated Traffic Management Systems Water and Waste Water Management. Consul General of Consulate of Norway Ann Ollestad presented his country’s perspective on Smart Cities. This was the 24th Smart City Summit organised by Elets. The company plans to organise 100 such Smart City conferences in line with the Smart Cities Mission of the Government of India.